Last week over 100 young members in UNISON met in Nottingham for a "Young Members" weekend. As you'll see from the video, they had a great conference and entered into some excellent discussions and debates. 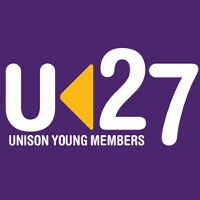 Are you under 27 and wondering about joining UNISON? Are you already a young member in UNISON and want to know more about getting involved and active? The branch is always keen to hear from young members, and if you're interested in getting more involved we'll provide training and if you'd like to go to event like this, we'll also cover all expenses, travel and accommodation for you! Just get in touch with us let us know who you are! You can also find out more about Young Members in UNISON on the national site.